For more Haiku My Heart, check out others who speak Haiku on Fridays, hosted by the lovely Rebecca @ http://corazon.typepad.com/. ~ by Dawn Elliott on February 23, 2012. I would love to sit on one of those chairs and catch those sunrays! Beautiful haiku! Oh! 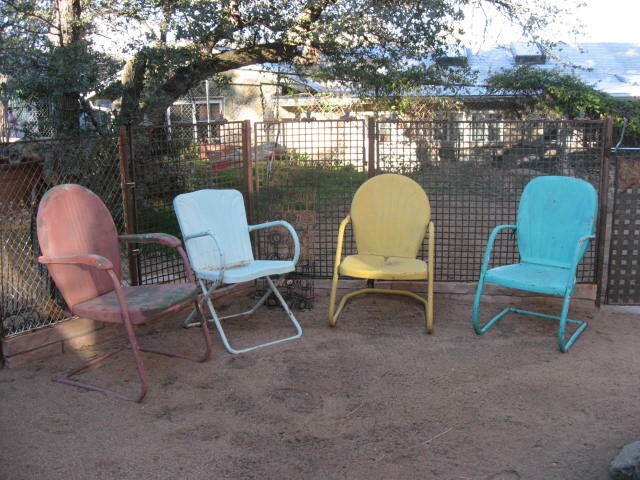 I just love these chairs…especially when they are all a bit different…just like the people who will ‘set a spell’ in them. Yes… I will sit here a spell and dream with you… love the picture and your haiku and all that it conjures! Thank you Dawn! Looks awfully inviting my dear. I don’t mind if I do. Love the picture, Very sweet! Oh, how I wish I could come and sit with you for a spell. Can the pink chair be mine? I could kick myself for not buying a beat-up $5 rocker at a garage sale this afternoon, but I’m already refinishing a dresser and didn’t think I’d have the energy to refinish another piece. So much work. Is this your patio? perfect haiku in every inclusive way!!!! woot woot!!! enjoy the dream of spring…i hear we will have snow by wed! enjoyed our recent visit, can’t wait to return the hospitality. set a spell.. yes, so inviting! love, love! the haiku and the chairs : ) perfection!